What are speed limits for, Daddy? What are speed limits for? Some people would stick up their middle finger and say “for ignoring”. Others would treat them with the reverence of a holy relic and demand they’re never, ever broken. A rather fundamentalist view of limits – and their enforcement – has driven road safety policy in the UK since 1992. “Speed kills so kill your speed” has been the cornerstone of road safety. And killing your speed has meant adhering, limpetlike and no matter what else, to the speed limit. No ifs no buts. It’s all about safety, not making council seats safer. There used to be a statistical basis to limits. You measured the natural speed of traffic along a given road in free-flowing conditions. You then assumed that 15% of the drivers were going too fast and set the limit at the 85th percentile. Limits were designed to reflect the idea that most drivers were responsible – otherwise why let them have licences in the first place? Actually, it’s a good bet. Most drivers – despite the best attempts to paint them as kitten-killing baby-eaters – won’t drive so fast they put themselves or others in danger. No-one wants to crash, and a road has a natural alignment and ‘feel’ that gives it a natural speed limit. Most people don’t do 90 down a singletrack, blind country lane and if they do, a limit’s unlikely to stop them. This “85th percentile” rule gave us 60mph limits in the countryside and 30mph limits in towns. It worked for years – since the 1930s – and meant new drivers and those unfamiliar with a road had an idea of the speed they should drive at. Limits at the 85th percentile gave the Police a stick too – when they needed it – to beat people going too quickly. But they left most people alone. The majority drove around the limit speed because, in effect, the majority set it. For speed limits to have the almost biblical weight government and local authorities now place on them, the numbers themselves must now be based on sound, fully-researched science, surely? Limits are set because Councillor X (under pressure from residents) and Officer Y set them that way, often ignoring advice from government and the (rather better qualified) emergency services. And they’re backed up with government advice that suggests they use a mean average speed rather than the 85th percentile. This has had the effect of making drivers drive unnaturally slowly on clear, safe, open roads with very few hazards – or break the law by using common sense and driving to the conditions. Blanket limits are now the first-line tool to slow drivers down. They were never, ever designed to be used this way. Limits were designed to reflect real world drivers driving in real world conditions. It’s clear from government advice that they don’t work when they’re used like this either. In the mid-1990s, some councils – beginning with Suffolk – began to change the way limits worked. They used them, not to recognise the behaviour of the law-abiding majority but as a tool to lower speeds. Despite massive non-compliance and concern from road safety organisations, the Police and Coroners’ Offices, other counties followed. 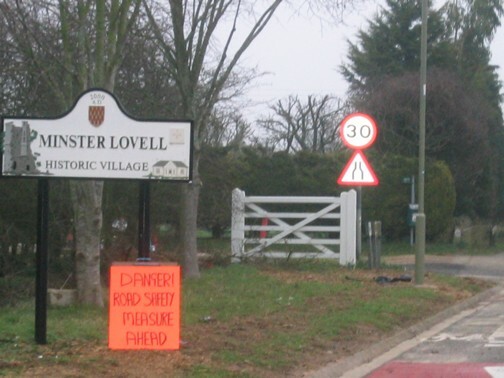 Now, in my own county of Oxfordshire, roads that were thought absolutely safe at 60mph a couple of years ago are now 30mph, 40mph and 50mph – and the limits change with a quite astonishing rapidity and with little regard to road alignment and character. It really has become ‘driving by numbers’. That’s nearly one change of limit every half a mile on roads where even seeing another car is an event. Like paint-by-numbers, it’s a bad facsimile. Councils now use limits as a proxy for safe speeds. Sadly, it’s not that simple. Safe speeds vary constantly – up and down – from driver to driver and second to second. Of course, that doesn’t give an excuse to rag through the centre of a village at 90mph, but neither – in my opinion – does it give a local authority the right to force a driver to drive at 30mph on a newly lowered road in clear, low-hazard conditions where 60 is safe. Speed limits were always intended to be powerful, effective servants – but never, ever masters. ← When Urals don’t start. And those that would are unlikely to stop doing it just because the speed limit says so. Every time there is an accident involving an insane bit of speeding, there will be a call for the limit to be reduced, as if someone willing to do 90 in a 40 limit would suddenly come over all law-abiding if the limit were 30 instead. The problem with strictly adhering to 85th percentile as a basis for limits is that only drivers get to vote on what is a “safe” speed. Hardly democratic now, is it? there is no evidence that 20mph limits make city streets safer either. Doesn’t stop every local councillor with an eye for votes promoting them. Although the late Paul Smith of Safe Speed had a rather unique personal style, I agree with his core message – there is far, far more to safe driving than sticking to a number. But speeding can be enforced by automatic cameras whereas crap driving needs trained traffic cops – and they’re too pricey these days, apparently. Though the Government can find 250 million quid for bin emptying. The 60 limit on single carriageway roads was introduced in the 70s as a fuel saving measure in response to the fuel crisis. The previous limit was 70. It was introduced by Barbara Castle in the 60s. Before that there was no blanket limit. I was wondering if I could possibly borrow the title of this blog post (or a variation of it) as a title of a letter fo my local paper? If you would also like to read the letter let me know, although the rest of that is my own writing. Feel free, Alex. Saw some of your FoI requests – if it’s any consolation, when the Wilts speed camera partnership started enforcing on the M4, we had to pay to get information on the causes of crashes from them. Be interested to see your letter and any responses it gets.